TREIRB’s website: Minister for Tribal Welfare has launched the website of Telangana Residential Educational Institutions Recruitment Board (TREI-RB) at the Secretariat. 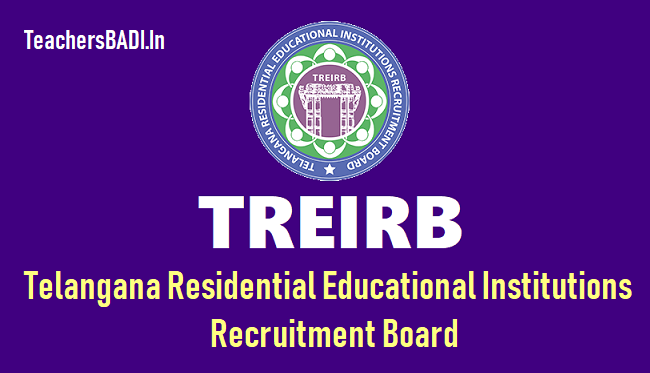 Information regarding notifications, scheme of examination and syllabus for recruitment to various posts in the welfare residential educational institutions societies can be had from #TREIRB website:- ww.treirb.telangana.gov.in. The board will take up recruitment of academic and non-academic staff of all the welfare residential educational institutions societies. Telangana Residential Educational Institutions Recruitment Board (TREI-RB): The Government of Telangana has been giving major impetus to educational empowerment of marginalized children by launching a large number of Social, Tribal, Minority and BC residential schools and degree colleges hitherto unheard of in the history of the government education sector in India. In recent years, Telangana Social Welfare Residential Educational Institutions Society (TSWREIS), Telangana Tribal Welfare Residential Educational Institutions Society (TTWREIS), Mahatma Jyothiba Phule Telangana Backward Classes Welfare Residential Educational Institutions Society (MJPTBCWREIS), Telangana Residential Educational Institutions Society (TREIS) and Telangana Minority Residential Educational Institutions Society (TMREIS) have been collaborating in various spheres to meet the aspirations of students and their parents. The core emphasis of collaboration has been on sharing best pedagogical practices, training the teachers and the school leaders in basic and advanced skills of school administration, and conducting the annual common entrance examinations to admit students in various societies. జులై 9 నుంచి ఆన్‌లైన్లో దరఖాస్తులు. తెలంగాణ గురుకుల విద్యాలయాల నియామక మండలి (టీఆర్ఈఐ-ఆర్‌బీ) ఉద్యోగ ప్రకటనలు వెలువరించింది. ఎస్సీ, ఎస్టీ, బీసీ, మైనార్టీ, సాధారణ గురుకుల సొసైటీల్లో కలిపి మొత్తం 2,932 పోస్టులతో రెండు నియామక ప్రకటనలు జారీ చేసింది. పోస్టు గ్రాడ్యుయేట్ టీచర్ (పీజీటీ) పోస్టులు 1,972 ఉన్నాయి. ఈ నియామక ప్రకటనలు, ఆన్‌లైన్ దరఖాస్తులను టీఆర్ఈఐ-ఆర్‌బీ(TREI-RB) వెబ్‌సైట్లో పొందుపరిచింది. జులై 9 నుంచి ఆగస్టు 8 వరకు ఆన్‌లైన్లో దరఖాస్తులు స్వీకరించనున్నట్లు గురుకుల బోర్డు ఛైర్మన్ తెలిపారు. ఎస్సీ, ఎస్టీ, బీసీ, మైనార్టీ, సాధారణ గురుకులాల్లో కలిపి దాదాపు 5,300 పోస్టులలో తొలివిడతలో టీజీటీ, పీజీటీ పోస్టులను మాత్రమే భర్తీ చేస్తోంది. డిగ్రీ లెక్చరర్లు, ప్రిన్సిపల్ తదితర పోస్టులకు తరువాత ప్రత్యేక ప్రకటనలు జారీ చేయనుంది. బీసీ, ఎస్సీ, సాధారణ గురుకులాల్లో పోస్టులపై ఇంకా ఆర్థికశాఖ అనుమతులు రావాల్సి ఉంది. 1. To take up recruitment of Academic and Non-academic staff of all the Residential Educational Societies. 2. To revise Service Rules and Bye-laws and Standing Orders of all the Residential Educational Societies in order to bring them to a common platform. 3. To prescribe minimum qualifications for each post in line with NCTE/other advisory bodies. 4. The Board may consult any expert including the School Education /Intermediate Education /Collegiate Education Department for any inputs. 5. Any other function as assigned by the State Government. Govt Of Telangana launched Telangana Residential Educational Institutions Recruitment Board (TREI-RB) website. Public can visit the TREI-RB’s website www.treirb.telangana.gov.in for information about recruitment notifications, scheme of examination, syllabus for various posts and other information. The board will take up recruitment of academic and non-academic staff of all the welfare residential educational institutions societies.